(c) 2014 by Ruthie-Marie Beckwith, Ph.D.
For well over a century, institutional peonage held individuals with intellectual, along with a host of other disabilities, in thrall to the maintenance and operation of the nation’s public institutions. By 1972, residents accounted for 47,000 workers in the institutions for individuals with intellectual disabilities alone. 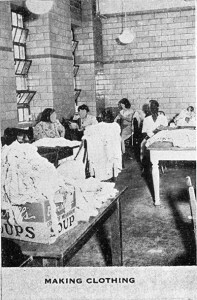 Resident workers shoveled coal; labored in the fields; worked in the laundry; cooked and served meals in the dining halls; scrubbed and cleaned throughout the facilities; and provided direct care for fellow residents. Resident workers drove tractors, ran machinery, and even fought forest fires. They did all these things and more—all unpaid—an invisible workforce that labored for ten to twelve hours a day, seven days a week. Five years later, it all came to a grinding halt. Beginning in the early 1970s, residents from across the country brought a number of lawsuits with Thirteenth Amendment claims—asserting their right to be free from involuntary servitude. The Peonage Cases, along with a number of other significant legislative and litigation efforts, set the field on a new course of normalization and the expansion of community based services. In 1974, in the matter of Souder v. Brennan, the Federal District Court in D. C. ruled that, for the first time, the Fair Labor Standards Act as amended in 1966 applied to hospitals, including the public institutions. This meant that, for the first time, resident workers were to be paid minimum wage for the labor they performed. Instead, states opted to cease their work programs and replace the resident workers with other non-disabled paid employees. The peonage cases brought into question over one hundred years of involuntary servitude by institutionalized individuals with disabilities. Their century of labor, unpaid but nonetheless regarded as worthy, is all but forgotten. Instead, today, over 400,000 individuals with intellectual disabilities spend their days in sheltered workshops where their potential for employment is measured daily, piece-by-piece, year after year, and remunerated at subminimum wages that non-disabled employees would not tolerate. From Peonage to Poverty and Back Again, traces the evolution of how the productivity of individuals with intellectual disabilities came to be exploited, devalued, and denied. It draws into the open those stories that represent the best of what people can achieve, even under the most coercive of circumstances, and then, be cast out into the most limiting and subservient of preoccupations. The legacy of the peonage cases is complex but one that warrants greater examination; present day challenges that bar the path to economic equality have roots that reach much farther back than has been appreciated. Peonage to Poverty and Back Again, calls for stronger narratives to counter those that have been used to dehumanize, and subsequently, put individuals with disabilities at even greater risks of exploitation. For, if the cause of economic equality for individuals with disabilities, long championed, is to be achieved, the right to be free of poverty-making practices must be fully embraced—before another century of servitude has come to pass.